Here are the top 24 in Master Chef Australia and their bio....enjoy!!! The Home Cooks – The Top 24! Working as a waiter at Nobu, Perth, Steven has seen some of the finest cuisine on offer. It’s a role that has made him realise that his skill and passion for food needs to be harnessed in the kitchen itself. Nominating his food heroes as Peter Gilmore, Heston Blumenthal and Nobu Matsuhisa, Steven would also relish the chance to cook alongside Marco Pierre White, with his drill sergeant style. Emily Loo is known as the Spice Queen among family and friends and celebrated for her signature dish, Sarawak Laksa. Born in Borneo, Emily is the youngest child of Pauline, a former primary school teacher and retired aircraft engineer James, with siblings Elizabeth, 41, and Ernest, 40. 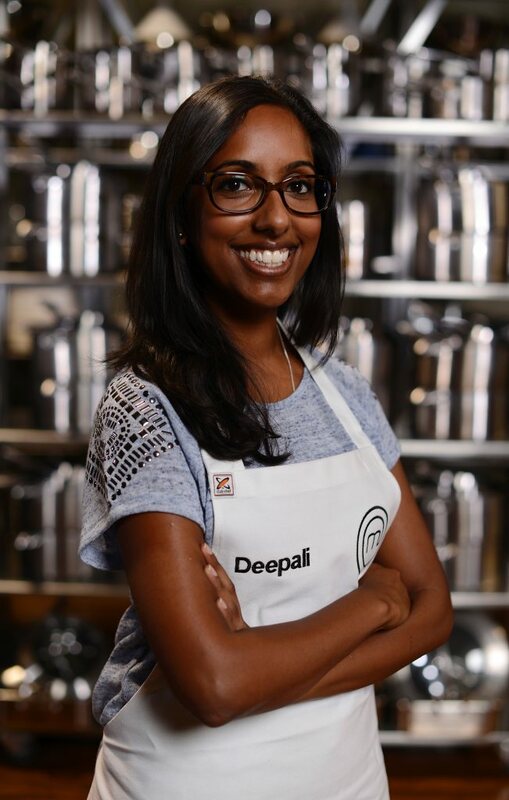 Canberra-based Tash Shan comes to the MasterChef Australia kitchen with the weight of the nation’s capital on her shoulders. For five years she’s watched on, impatiently awaiting citizenship to finally live her dream of cooking in Australia’s most famous kitchen. Born in Malaysia, Tash moved to Melbourne aged 19 to pursue a double degree in Law/Communications. Tash’s Chinese-Indian heritage meant that she was surrounded by big flavours growing up. 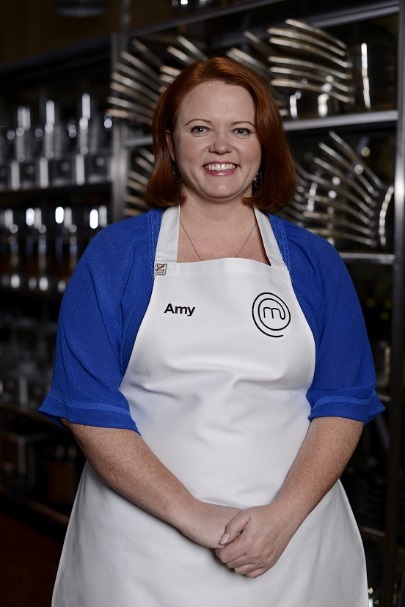 Born in Johannesburg, Amy moved to Perth with her family aged 24 as her dad, now passed on, was Australian. Back in Perth in 2005, one of Amy’s biggest hurdles in life came after being diagnosed with gynaecological cancer at age 28. She fought hard to keep her fertility intact and is now in remission. Ben grew up two hours north of Auckland in Whangarei, New Zealand. It was while living in Newcastle Upon Tyne in 2002 that Ben confronted one of the biggest challenges of his life. Diagnosed with Acute Lymphoblastic Leukaemia, Ben spent six months in and out of hospital, followed by a further three years of treatment. Now in remission for more than 10 years, the illness was a turning point in his life, proving his resilience and tenacity. Ben’s love of food intensified as he indulged his love of travel from his UK base. He clocked up visits to almost 100 countries, including India, Thailand, Morocco, Egypt, Mexico, Cuba, Argentina, Japan, Costa Rica and more. Along the way he enjoyed street food, fine dining and everything between. Brisbane-based Retail Manager Brendan Langfield knows a thing or two about being in the limelight. 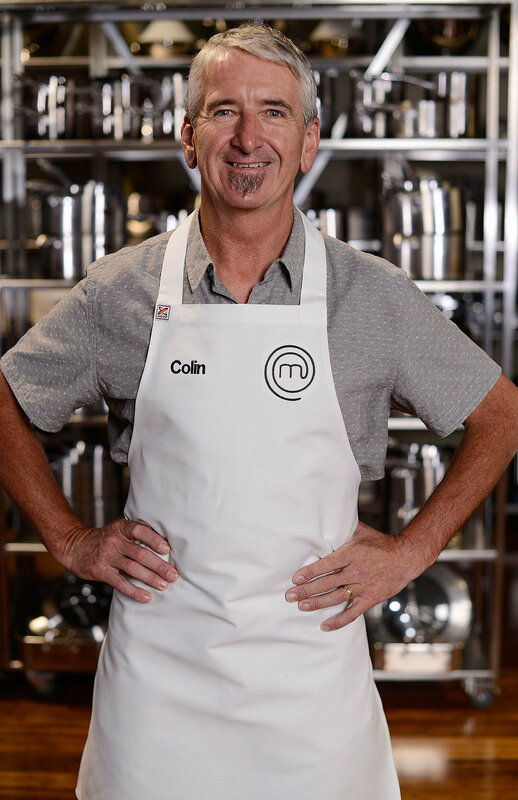 Having spent a good deal of his life behind a bass guitar in pop-rock band Finabah, it’s now time to don an apron in the MasterChef Australia kitchen. Brendan credits his dad, Michael, with inspiring in him a love of cooking that stretches back to childhood. 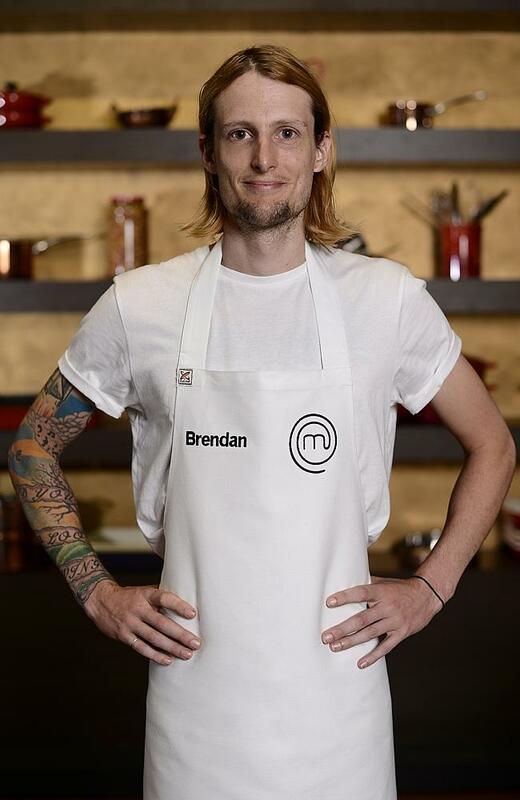 “Food is what brings us together and always will,” says Brendan. He cites his food hero Anthony Bourdain’s book Kitchen Confidential as a big inspiration in getting serious about food and confesses he’s now looking for the thing to commit to in his life, ready to give it his all. Most days, this fiercely independent, hard-working young man can be found behind the wheel of a bobcat, but increasingly, his mind is elsewhere, dreaming up menus. A completely self-taught cook, Brent became interested in cooking at age 16. Watching countless cooking shows, Brent realised his true passion for cooking and, along with lots of practice in the kitchen, he has continued to draw inspiration from watching his culinary heroes on screen. “I’m often told by people ‘it would be impossible for anyone to love food as much as you’, but I want to see if I can really cook and if my food is good. I’ve never had professional criticism and I’m ready for it.”Looking up to the likes of Jamie Oliver, Anthony Bourdain and the self-taught Heston Blumenthal, Brent would love to make his own travel series for TV, showing off global destinations, food cultures and traditions. 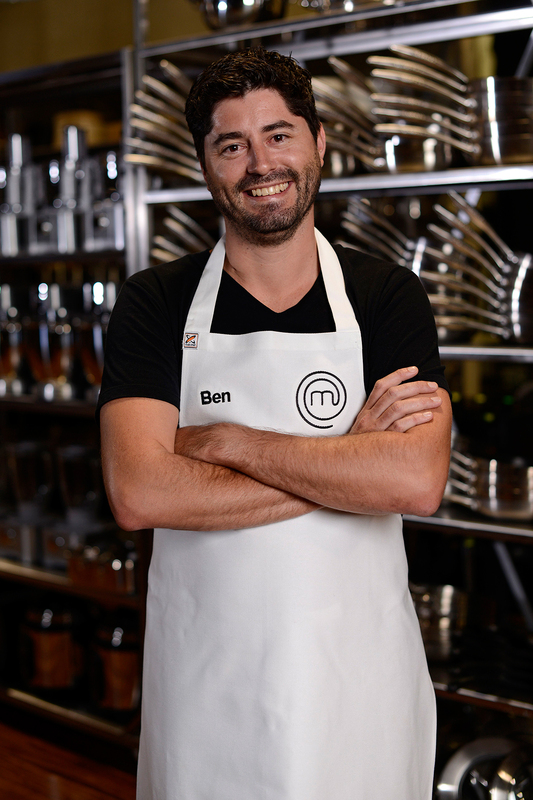 Turning his back on the high life and the high seas, Byron Finnerty is ready to take his place in the MasterChef Australia kitchen. Byron has spent the past two years travelling the world as a deckhand on the super yacht Odessa. Rubbing shoulders with the likes of the Red Hot Chilli Peppers and Owen Wilson, Byron couldn’t deny his love of food any longer, giving it all away to take his place in the top 24. His dream is to cook alongside Ferran Adria from the legendary elBulli. “Once I know what I want, I’ll do everything it takes to achieve that dream”. A successful builder in Melbourne, Colin and wife Fiona were regular visitors to South Australia’s beautiful wine regions. Always intrigued by the art of wine-making, Colin volunteered for four weeks at Murray Street Wines in the Barossa. It sealed his fate. He now makes wine under his own label, winning coveted awards; his 2008 Shiraz was voted seventh best in the world by Winestate magazine. A dentist by trade, Deepali once had a research project published in the respected European Journal of Paediatric Dentistry. Although she loves what she does, she’s now ready to lay it all on the line to vie for the title of Australia’s MasterChef. A fan of the Western Australian climate and lifestyle, the only thing missing for Deepali is authentic Indian cuisine. After moving to Australia, Deepali became serious about her cooking. It was a way to recreate her mum's much-loved home-cooked flavours. This competitive, confident Marketing Coordinator from Templestowe, Victoria, is ready to win. Emelia – aka the Dessert Queen, famed for her panna cottas – was encouraged in the kitchen from an early age. She remembers watching and learning from both her mum and baba. She would also get her hands dirty to help, kneading doughs and baking treats. Describing herself as crafty and capable, Emelia sees MasterChef Australia as her chance to refine and extend her natural skills. Georgia Hughes has laid her future on the line to take up her place in the MasterChef Australia kitchen. Part-time work serving customers at Adelaide chocolatier Steven ter Horst has helped focus Georgia’s love of chocolate and patisserie. While she has always loved watching MasterChef Australia, she considers her selection into the competition as fate. Georgia looks up to a variety of big name chefs for inspiration. Jamie Oliver is her savoury food idol, while Adriano Zumbo would be her sweet idol for his masterpieces and for being like a “real life Willy Wonka”. This young dad has his eye on the prize and creating a solid future for his family. Jamie says he decided he wanted to be a chef at age six, mesmerised by the kitchen prep in a family friend’s restaurant. Jamie fell into bar tending, which he’s done for eight years - seriously for four - as he has worked his way up. His food heroes include David Chang, Jamie Oliver, Thomas Keller and Luke Nguyen. Eating at Momofuku and Tetsuya’s changed the way Jamie looked at dining. At 31, Kira Westwick is not only a busy mum of two, but an accomplished businesswoman. She runs two health and fitness studios on the Gold Coast with husband Adam. Kira’s food idols include wholefood pioneers Cynthia Louise, Matt Stone, Stephanie Alexander, Jude Blereau, David Wolfe and Lola Berry. She also admires Jamie Oliver, whose work with children reflects her own food philosophy. Seldom without a smile, Laura Cassai lives, breathes and dreams food. Laura says cooking is in her blood. Laura’s food heroes include Jamie Oliver, Donna Hay and Antonio Carluccio. A massive fan of Stephanie’s Kitchen Garden Program, Laura hopes to become an ambassador. At 193cm, Nick Doyle is a gentle giant. Hailing from the tiny town of Gilgai, near Inverell in country NSW, this boy from the bush grew up on 900 acres. Now he calls Newcastle home, where he’s the first of his family to attend university. Nick’s food heroes include Maggie Beer, Darren Purchese, Philippa Sibley and Nigella Lawson. Along with MasterChef Australia’s own Gary Mehigan, all offer Nick inspiration in the kitchen for both their skill and passion. Over the past year Nick’s attitude to food has changed. Having dropped an impressive 50 kilograms in eight months through diet and exercise, he understands that food is about more than just taste. While Nicole Cleave might be the eldest contender in 2014’s MasterChef Australia kitchen, this mum of four has as much get up and go as her younger counterparts. Recalling it as a light bulb moment, Nicole was enchanted during series two of MasterChef Australia by Philippa Sibley’s take on a Snickers, the caramel parfait glace dessert. Nicole adores Asian cuisine and it’s a firm fixture within her repertoire. Kylie Kwong is a chef she admires and respects, while Tetsuya Wakuda is her ”total idol”. After years of a transient lifestyle in the Defence Forces and the challenges of family illness, it’s time for Darwin-based Rachael Ciesiolka, a tough lady with a can-do attitude, to follow her dreams. It was an unexpected threat to her husband’s health that provided the family with its most confronting time. Tim suffered an angina attack at 36, a stroke at 37 and was diagnosed with esophageal cancer at 38. A harrowing time for Rachael, there was finally cause for celebration when, on his 40th birthday, Tim was given the all clear. 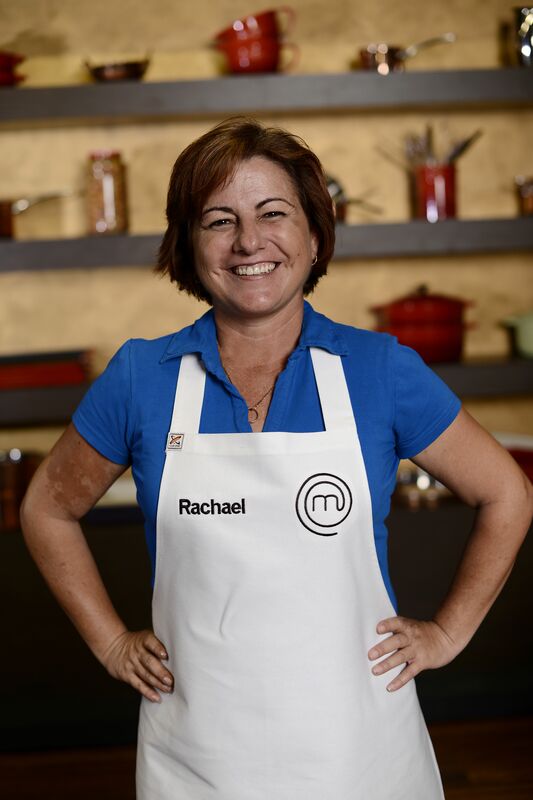 “I want to prove to myself that I can do this, and to do something for me,” says Rachel of her entry into MasterChef Australia. Rachael counts Rick Stein and Maggie Beer as her food heroes, admiring their commitment to food ethics and sustainability. Renae Smith lives by these simple words: “If it doesn't make you happy then don't do it.” Based in Newtown, Sydney, Renae grew up on the Central Coast in a happy, albeit strict, Jehovah’s Witness family. Looking up to Jamie Oliver (“his passion is just addictive”), Renae also loves Martin Benn and Christine Manfield, admiring their creativity and the fact they do what they do from such a place of passion and love. From a close-knit family of five, fashion designer Sam Gant grew up on a 50-acre farm by the coast near Geelong, indulging both her love of the water and the outdoors. As much as she enjoys her work, Sam believes her love of food could be more than just a hobby. She feels ready to push herself towards this new path, one that has led her to the MasterChef Australia kitchen. Sam’s cooking style is rustic, warm and spontaneous. She names Julia Childs and Donna Hay among her food heroes. 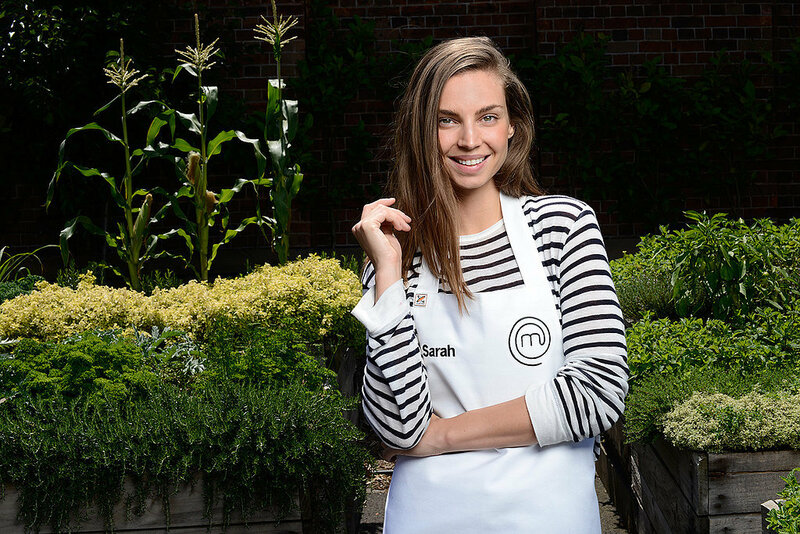 Fresh from traveling the world on glamorous modelling assignments, Sarah Todd lands in the MasterChef Australia kitchen with a point to prove, and a new future to create. Sarah was signed by a modelling agency at 18 and moved to Sydney to pursue her career. Modelling was an incredible career that gave her the opportunity to discover different cultures and cuisines and in turn fuelled her love of food. “I have realised my passion and that I want to pursue it and create a career in the food industry.” Sarah looks to an array of chefs for inspiration, including Nobu Matsuhisa, Marcus Waering, Angela Hartnett, Neil Borthwick, Phil Howard and Alla Wolf-Tasker. 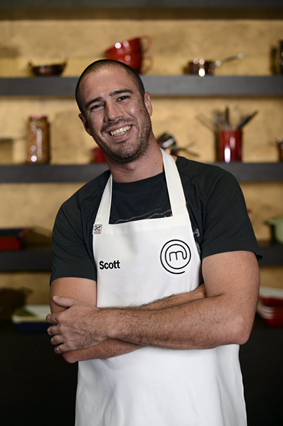 A self-taught cook and a quick learner, Scott loves nothing more than cooking for friends and housemates, trying out new recipes out on them. He also admires Matt Stone’s organic cooking style and would one day love to work alongside him. The eldest of four kids growing up on cattle farm in Kilkivan, Queensland, Sean learned to appreciate fresh produce from an early age. This mum of three from the Barossa is determined to live life with no regrets and that includes pursuing her long-held food dream. Cooking since she was eight years old, Tracy is self-taught. Not one to shy away from a challenge, 2008 served up more than its fair share. Tracy faced a lengthy battle with an undiagnosed virus and pleuritis, which affected her heart and saw her bedridden for four months. There was a very real possibility she might not survive and it took a year to recover fully. She says she looks up to the likes of David Thompson, Matt Wilkinson, Andrew McConnell, Stephanie Alexander and, of course, Maggie Beer as her food heroes. dulu ada yang Malaysian.. perempuan.. lupa nama apa..